Diego Rivera mezmorized the audience with his Jazz solos during a concert with the RHS Jazz Band. Diego Rivera captivated the audience with his smooth Jazz saxophone sounds as he performed in concert on February 12, 2018 with the award winning Rockford High School Jazz Band. 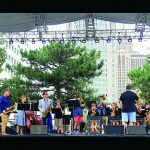 “What a pleasure to share the stage with such a talented group of young musicians,” expressed Rivera. Following the concert, Rivera met with fans for picture taking, autographs and words of encouragement to the audience members. With funding from the Rockford Education Foundation, the members of the RHS Jazz Band spent the afternoon learning the finer techniques of Jazz performance with Rivera. 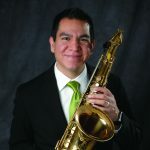 He currently holds an appointment as Assistant Professor of Jazz Saxophone and is the Associate Director of Jazz Studies at Michigan State University. Next in the Guest Artist Performance Series will be saxophonist Steve Wilson and the Michigan State University Be-Bop Spartans Jazz Orchestra on March 21, 2018 at 7:00 pm in the RHS Fine Arts Auditorium. Tickets are $10 per adult and $5 for students and seniors age 62+. 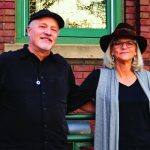 All seats are general admission and tickets can purchased online at www.rocktix.org or at the door. 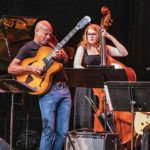 In addition to Wilson and the MSU Be-Bop Spartans, the jazz bands from Rockford and Northview High Schools will also be featured in the concert.